Review: A farm laborer convinces the woman he loves to marry their rich and dying boss. This is so she could have the claim to his fortune. A typical Terrence Malick film where not a lot happens and the characters are just standing in fields. This is a very good film which might feel a bit dated for today’s audience. Terrence Malick spent two years editing this film. Al Pacino and Dustin Hoffman were offered the roles of Bill but they both turned it down. It is reported that exteriors of the film were shot in Alberta, Canada. At the Academy Awards in 1979 this won a Oscar for Best Cinematography. At the Bafta Awards in 1980 Ennio Morricone won the Anthony Asquith for Film Music award. 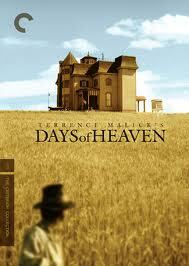 In 1979 at the Cannes Film Festival Terrence Malick won the award for Best Director. One film critic wrote “Unforgettable 1978 love triangle drama includes violence”.